I received an award from my cyber friend Rita. This is my first ever blogger award and I'm really thrilled. Visit her blog and see her wonderful creations. 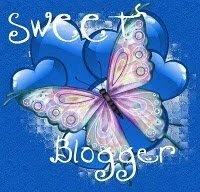 Here are 5 other blogs that I like to read and who deserve a 'sweet blogger' award. So I am sharing my award with these five amazing and talented ladies and hope they will share the award with 5 other ladies and link back to me. I'm pleased to say that I am almost up-to-date with all my creative projects. Although sadly, I have not even started the Shimelle 'Something from Almost Nothing'. Over the weekend I finished my entry for my own mixed media Circle Journal on UKS and posted it on time. My CJ is called Once Upon A Time and each entry will be based on books I remember from my childhood. My first entry is based on Alice's Adventures in Wonderland. Today I completed four of the six challenges on Scrapbooking from the Inside Out. The theme this month has been Nostalgia. The journaling is behind the photos and is about the choices you make. When I'd written it, I was reminded of the film 'Sliding Doors' which looks at what happens to one woman based on the decisions she makes. I think it makes an excellent title for this layout. If I'd thought of the title before I stuck the layout down I would have made the doors slide instead of open like a hinged door. I also did this one of me when I was very little and in the little envelope is a letter written from me to myself as a child. The challenge was to: Create a LO where you 'speak' to your 'little girl'. What would she need to hear to make her life easier? What do you want them to know? I made this with some of the kit I bought from Morag and Nicki and I used one of Morag's layouts as inspiration. Thank you girls. This is it before I started altering it. Then I tore out the photographs, quite a few of the pages and then stuck the remaining pages together in clumps. I've started painting over the pages with gesso or acrylic paint. This book will take some time as I have to wait while pages dry - which isn't actually very long - but I go off and do something else and forget to come back to it!! If you read my March 8th entry you will see that I had lots of deadlines to work to. Not that deadlines meant much to any ideas or inspiration I got over the last week! So although there are dates that all these projects must be finished by, I worked in a completely random order!! The tags on the last entry had to be sent by 26th & 27th March respectively but were posted yesterday. I finished my entry for the Twilight Circle Journal yesterday and then packed it ready for posting before remembering that I hadn't photographed it. Anyway, the layout was about Forks which is the town where the Twilight series is based apparently. I say apparently because I don't have any idea what I'm talking about having never read the books or seen the films. However there's a really good website about Forks and the surrounding area, so I was able to find some really good photos. That needs to be posted on 26th March. The Twilight CJ was the one with the earliest deadline but despite that I had worked first on the All My Own Photos Circle Journal which isn't due until April 12th. This is the cover of my 6½x6½" book. It has chipboard covers painted with Claudine Hellmuth paint and then paper stuck on. The book will be about all the activities surrounding my 60th birthday and I have done the first entry about the champagne breakfast Denise organised for me. And then each person who does a double layout has to 'sign in' on one of the tags at the back. I started working on the Mixed Media CJ using a 9"x9" Bo Bunny Bare Naked Binder which I bought from Craft Island. This was the first online site I ever bought scrapbooking materials from! I painted the front cover and then inked over it with alcohol inks. I put cloud shapes on as masks before inking but most of the clouds have been covered up! I cut flowers and houses from some Squiggly Ink papers and glued them on with gel medium and coated the whole front cover with the gel medium to act like a varnish. Then I stamped over the top of that. I double heat embossed the letters before sticking them on the cover. I haven't decided what to do on the back yet or which of the many children's books I'm going to choose to interpret as my entry. It needs to be ready to post on March 29th so I have a little time yet. As for Shimelle's class ~ I haven't even started. So I'm now 4 prompts behind! And the 5th one is due tomorrow! On Thursday I went to Artist Trading Post for a Mixed Media Canvas Workshop. I love going to the workshops at ATP ~ Anneliese is such a great teacher and I get to meet people I wouldn't normally meet otherwise. ATP is at least 50 miles from home and mostly the journey isn't too bad especially once I get past Lichfield. Anneliese gave us a a 39x30cm blank white canvas to work on. First we used Distress Inks all over and then some Claudine Hellmuth paints. Anneliese demonstrated various techniques that we could choose to use on our canvases. Then it was playtime. I stamped onto the canvas and I stamped onto tissue paper which I adhered with melted beeswax. I added some chipboard flowers and a piece of printed cardstock. It was still looking rather too much like the clothes I was wearing in terms of the colour so I added some more blue paint. I heat embossed the word Dream and stuck on some painted chipboard letters for BIG. I still feel it is unfinished but I'm currently not sure what to add to it so I am going to leave it for a while and come back to it. Anneliese took a photo of me working on the canvas. I am also hosting a new Circle Journal which is alterd art/mixed media. My theme for that is Children's Literature and the book will be called 'Once Upon A Time, when I get round to making it. The third CJ I'm in is called 'All My Own Photos' and you send the photos you want putting into the scrapbook and each team member does a layout around your photos. My book is about my 60th birthday. It is called 'sesenta' which is the name of the dog Andy & Naomi gave me for my birthday. Sesenta is Spanish for 60. The two Swaps I am doing are the Monthly Altered Tag Swap (March) and the Artsy Bookmark Swap. These are both at the thinking stage. In addition to all these I am also making a 2010 Minibook which has two page layouts for each month. Here are the pages for January and February. And then of course there's 'Something From Almost Nothing' that Shimelle's starting on Wednesday that I mentioned before! I obviously have no self-control. Perhaps it's hidden under all the papers, paints, embellishments, stamps, tools and all the other requisites for creativity!